So cute! 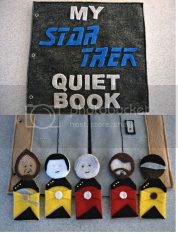 Here's a pattern you can buy for this Star Trek Quiet Book - an old-fashioned fabric book for kids with snaps, velcro and the like. It's available on etsy. haha! Too awesome! I love how it's next gen. That's what I grew up with since my mom is an original trekkie (not too extreme though, just a fan).